The offshore loading pier at Dominion has not received a ship importing liquefied natural gas since January 2011. In energy-hungry countries, all eyes are on Pennsylvania’s Marcellus Shale gas. In a dramatic shift from just five years ago, the U.S. is looking to export, instead of import natural gas. And if more natural gas starts getting shipped abroad, Pennsylvania’s Marcellus Shale could help change the global market for natural gas, and lighting homes in Tokyo. The U.S. currently has two export terminals, one in Sabine Pass, Louisiana, and the ConocoPhillips LNG export terminal in North Cook Inlet, Alaska. 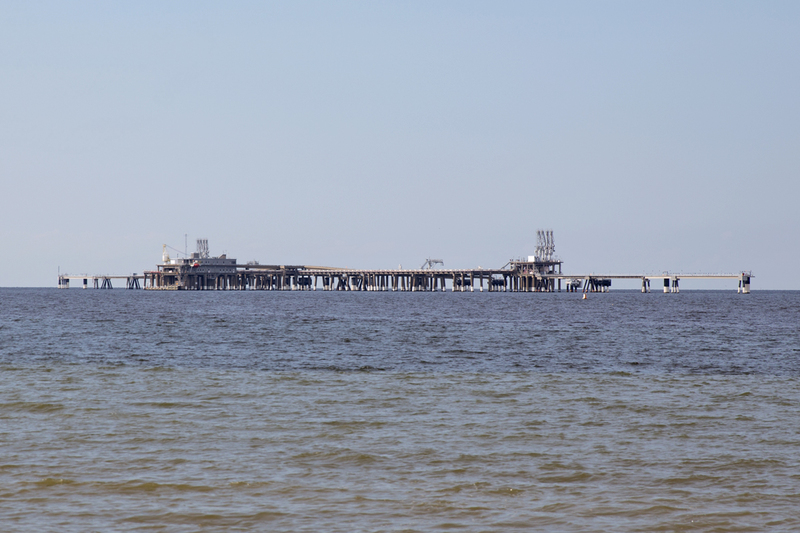 The U.S. Department of Energy just gave preliminary approval for ConocoPhillips to expand its Freeport, Texas import terminal to export liquefied natural gas. About 17 other export proposals now await approval by the DOE, including the Cove Point liquefied natural gas import terminal operated by Dominion Resources. The offshore loading platform (background) as seen from the Cove Point Lighthouse. 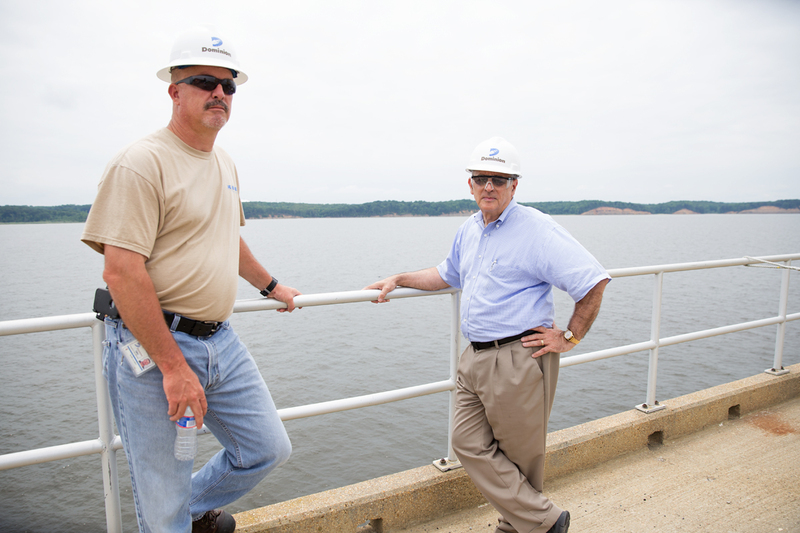 Daniel Donovan (right) with marine supervisor Keith Lavender says Dominion is third in line for consideration by the Department of Energy for liquefied natural gas exports. 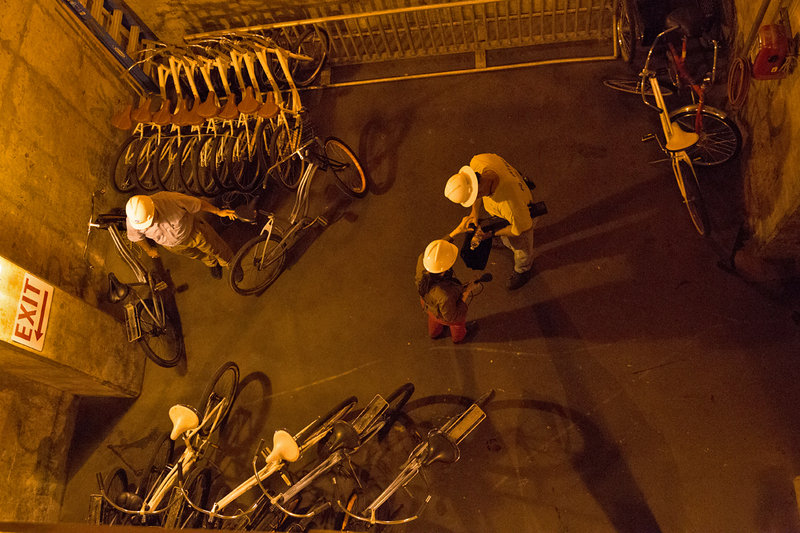 Workers ride bicycles through a tunnel to reach the offshore pier. Marine supervision Keith Lavender pedals through a tunnel beneath the Chesapeake Bay onto the offshore loading pier. Ice forms on the liquefied natural gas pipes on a 70 degree-day at Dominion’s Cove Point LNG Terminal. 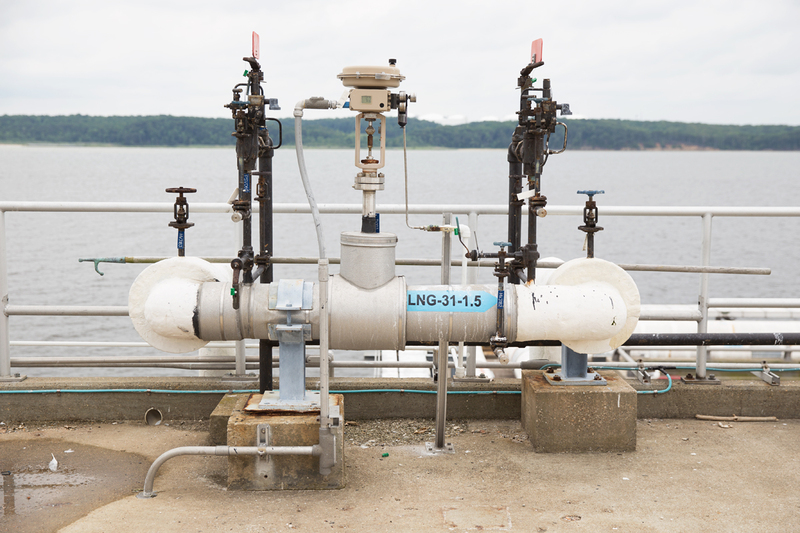 Liquefied natural gas is stored at minus 260 degrees Fahrenheit. 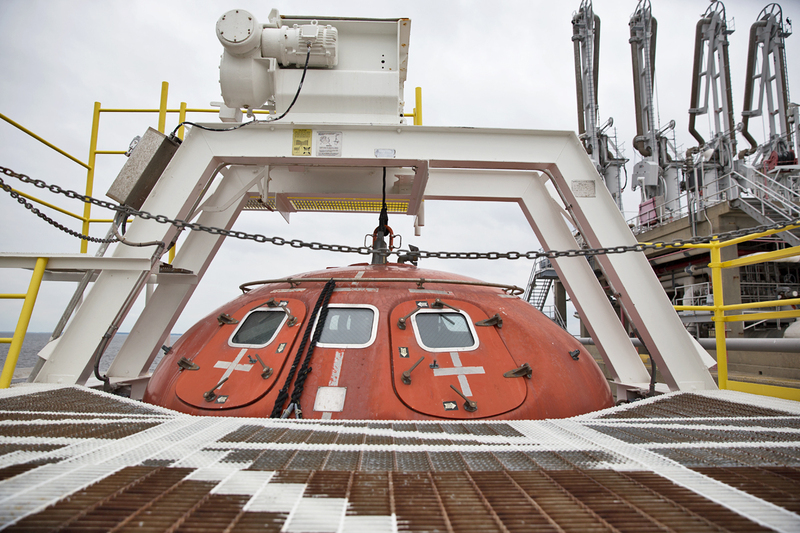 An escape capsule fits 28 people in case of an accident on the offshore loading pier. There are three capsules located on the pier. 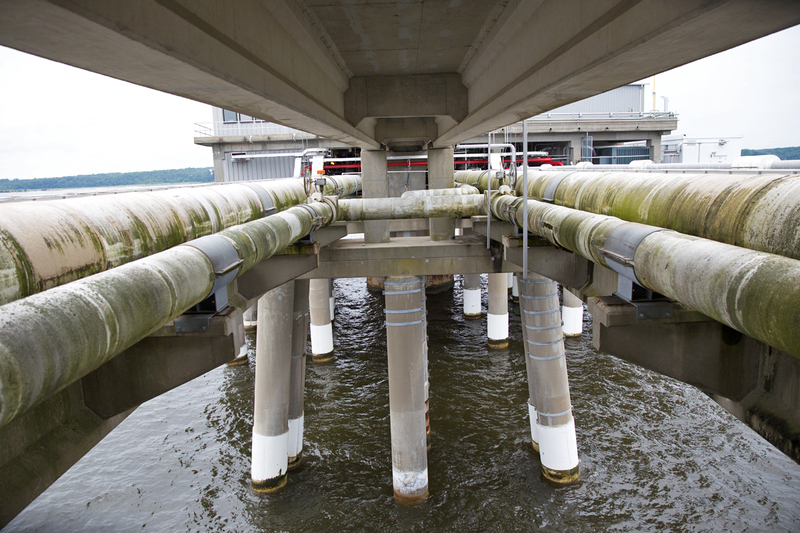 Liquefied natural gas pipes run under the loading pier and along a mile long tunnel under the Chesapeake Bay to the onshore facility at Cove Point, Md. 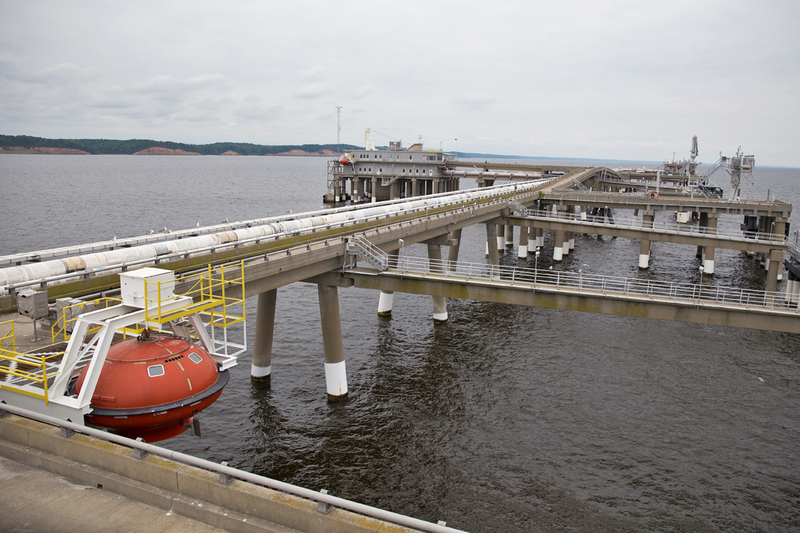 Liquefied natural gas circulates around the loading pier about a mile off shore of the Dominion transfer plant. 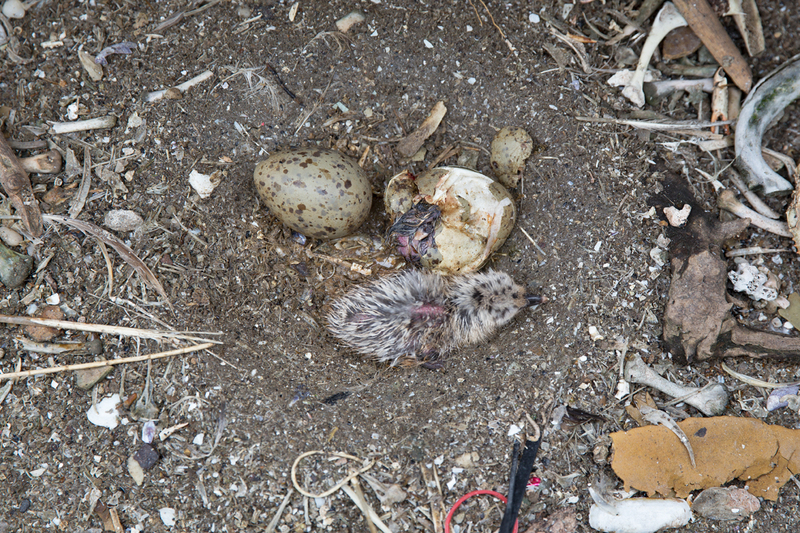 A nest of baby seagulls found between pipelines on the offshore pier. Unloading arms on the offshore pier transfer liquefied natural gas to the Dominion terminal. Dominion wants to transform this plant to export liquefied natural gas. 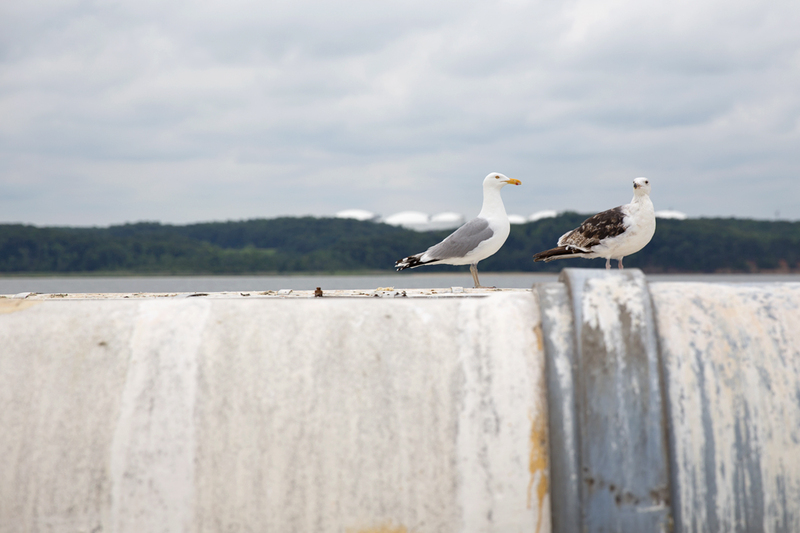 Seagulls find a home on the offshore loading pier. Dominion’s offshore loading platform at Cove Point. Lusby, Maryland. Dominion wants to start exporting LNG from this platform. 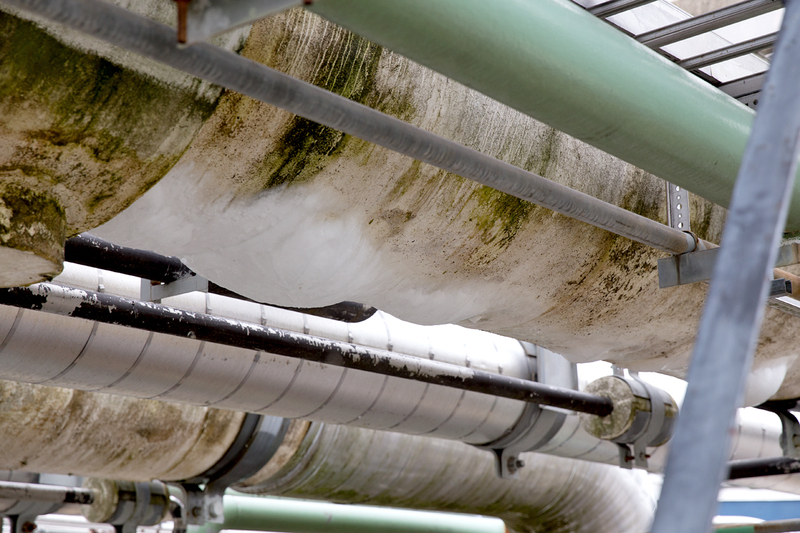 Pipes carrying liquefied natural gas circulate around the terminal into holding tanks. In areas of northeast Pennsylvania, drillers say they’ve hit the “sweet spot.” In a drill rig several stories up above a Susquehanna County forest, gas workers guide a giant diamond drill bit, about the size of a basketball, as it cuts through the rock thousands of feet below. Steve MacDonald is in charge of this operation for Cabot Oil and Gas. Downhole in places like this Cabot Oil and Gas well, the company has struck gold, so to speak. Cabot’s natural gas production volumes and profits soared in 2012, exceeding all expectations. And because of wells like these in Pennsylvania’s Marcellus Shale formation, a glut of natural gas has developed nationwide. Domestic prices for natural gas have dropped about one-third, since July, 2008 before the shale boom really took off. But overseas, prices are three or four times that. So drillers here want to ship their gas abroad. The economist for the American Petroleum Institute, John Felmy says exporting Marcellus Shale gas makes sense. API’s John Felmy talks to StateImpact Pennsylvania about exports. As the price has dropped, production in some of Pennsylvania’s gas fields has tailed off. In what some call a stroke of luck, the wells across Pennsylvania could easily be connected to an existing interstate pipeline system, which links up to a nearby import terminal. One of seven holding tanks at Dominion’s Cove Point Liquefied Natural Gas Terminal. That import facility lies about 320 miles south of Susquehanna County, on a spit of land jutting out into the Chesapeake Bay, where large white cylindrical tanks are surrounded by a network of 32-inch pipes. The Cove Point liquefaction plant is operated by Dominion Resources. 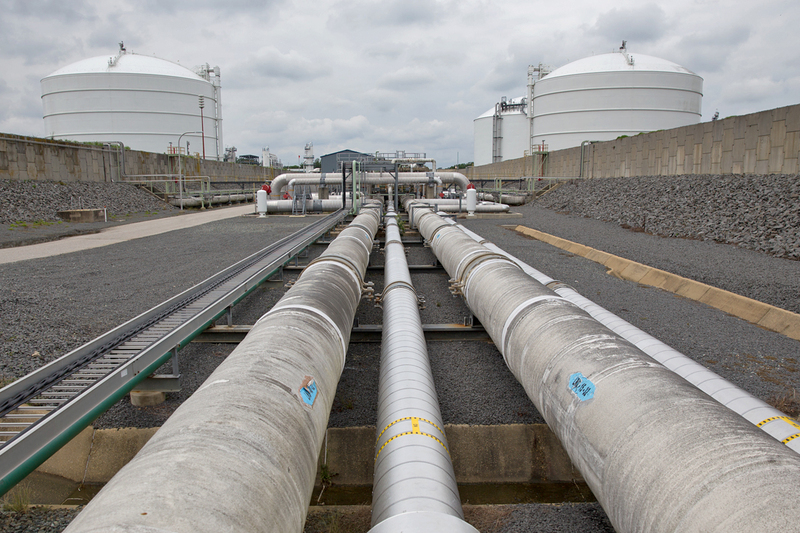 And Dominion also owns and operates a pipeline system that connects these tanks to Pennsylvania’s gas fields. It was only a couple of years ago when plans for that system were to use it for storage and transport between different markets on the East Coast. Today, the company wants to reverse the flow, transporting shale gas to their export facility in Lusby, Md. The onshore liquefaction plant sits surrounded by a nature preserve. 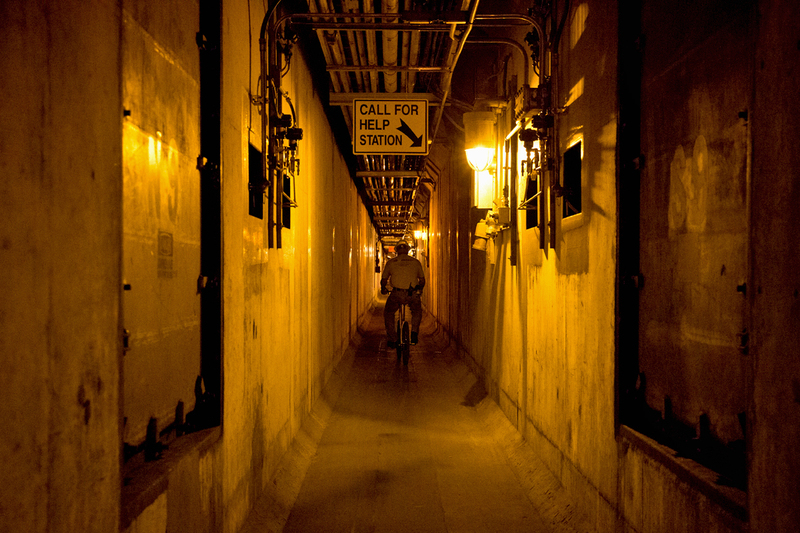 To get to the offshore dock, visitors have to head down into a tunnel and use a bicycle to travel beneath the water to the pier that lies out in the middle of the Chesapeake Bay. Before any natural gas gets shipped overseas, it has to be cooled to minus-260 degrees Fahrenheit, the point where it becomes liquid. Export plants that liquefy the gas cost billions of dollars to build. So what they want to do at Cove Point’s idled import facility is spend the relatively bargain basement price of $4 billion converting it to an export facility. The last time a ship docked at this pier was on New Years Day of 2011. Since then, the seagulls have moved in and made it home. Hideaways beneath large pipes hold nests with chirping chicks. A nearby dump provides scraps of food, which the nesting birds bring back safely to this deserted pier, leaving the white-washed dock littered with chicken bones and bird poop. Liquefied natural gas technician Ernest Ortiz monitors the process from the offshore control center. Ortiz says he would love to start seeing ships coming to the dock. The last one to unload LNG was on New Years Day, 2011. Dominion Resources spokesman Dan Donovan says this facility would make one of the best places in the U.S. to export natural gas. Donovan’s point about the pipelines is key. The company’s plan for their pipeline system used to be to pump imported natural gas to states like New York, New Jersey and Ohio. But their plans have changed almost overnight. “No one saw this coming,” says Donovan. And Dominion wasn’t the only industry player surprised by Marcellus Shale production. Wolfgang Moehler is the director of global LNG, the shorthand for liquefied natural gas, for the firm IHS Global. “[The years] 2007, 2008, the assumption was that the U.S. would become, in the next ten years, the largest gas importers in the world,” says Moehler. But today, that assumption has been turned on its head, thanks in part to all those productive Marcellus Shale wells, and the March, 2011 nuclear disaster in Japan. Japan’s energy situation changed dramatically back in March 2011. Before the meltdown at the Fukushima Daiichi plant, nuclear energy supplied a third of Japan’s needs. Where it once had 50 nuclear reactors, today the country is down to just two. Photo taken from a Kyodo News helicopter over the town of Okuma, Fukushima Prefecture, shows the Fukushima Daiichi Nuclear Power Station on Tuesday, July 9, 2013, more than two years after the meltdown. Tokyo Electric Power Co., the operator of the crippled plant, said the same day that the density of radioactive cesium in groundwater by the sea at the plant has soared to around 90 times higher than three days previous. Analyst Wolfgang Moehler is watching a dramatic shift in the global LNG market, partly due to increasing energy needs in developing countries like India, and the loss of nuclear energy in Japan. “So a significant amount of that electricity production had to be substituted from fossil fuel generation,” says Moehler. Japan was already the world’s largest importer of natural gas, but since Fukushima, the pace has increased steadily. Moehler says Japan would love to snag some of that cheaper American gas coming from Pennsylvania’s gas fields. And Pennsylvania’s gas producers would love to sell at a higher price. He explains that importing nations like Japan are locked into long-term natural gas contracts tied to the price of oil. Photo shows the inside of the world’s largest liquefied natural gas tank in Yokohama near Tokyo, unveiled by Tokyo Gas Co. on March 13, 2013. Japan’s imports of LNG hit a monthly record of 8.23 million tons in January. But Dominion Resources still has a number of hoops to jump through before it starts piping in Marcellus gas, liquefying it, and shipping it out. IHS analyst Wolfgang Moehler says despite current contracts with neighboring countries like Australia and Indonesia, it may still be cheaper for Japanese energy companies to pay for the Cove Point conversion, and the extra transportation costs of shipping LNG through the Panama Canal to the Pacific rim. This is how good a deal Marcellus Shale gas seems to companies in Japan. Sumitomo Corporation, a Japanese trading company and its U.S. affiliate Pacific Summit Energy, has agreed to help foot the almost $4 billion bill to convert Cove Point to a natural gas export terminal. That company, along with the U.S. affiliate of India’s GAIL Ltd., have signed 20-year service agreements with Dominion to provide natural gas. 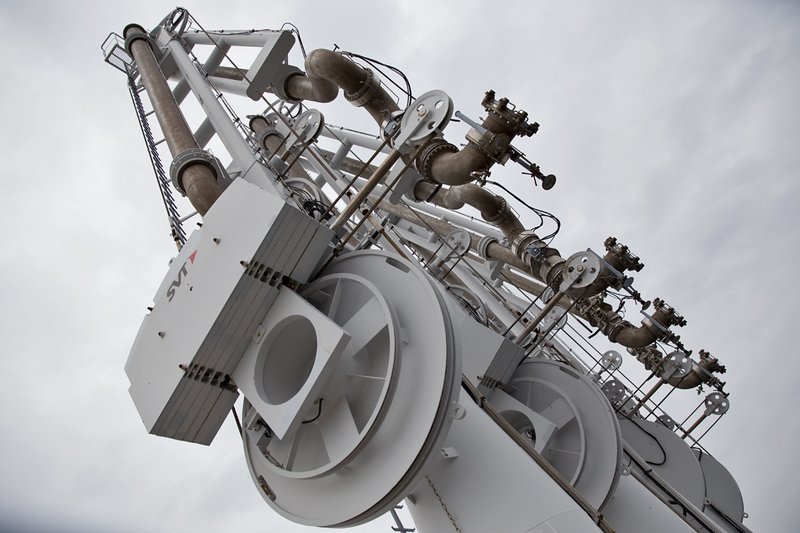 Sumitomo has since announced that the exported gas would be sold to Tokyo Gas and Kansai Electric Power. First, the U.S. Department of Energy has to approve any deals with non-free-trade countries, and determine if they’re in the public good. Dominion’s Dan Donovan says they’re pretty confident their proposal will gain approval from the DOE. The Federal Energy Regulatory Commission also has to weigh in. The state of Maryland has to issue about 30 different permits. And not everyone is thrilled with LNG exports. American manufacturers don’t like the plan, because cheap natural gas has helped domestic factories become more cost-efficient. They say exports would raise prices at home. Listen to StateImpact’s interview with George Biltz of Dow Chemical. On the environmental front the Sierra Club is challenging the Cove Point plan in court. Sierra Club attorney Craig Segall says regulators should not turn a blind eye toward the impact of increased production in natural gas fields like Pennsylvania. 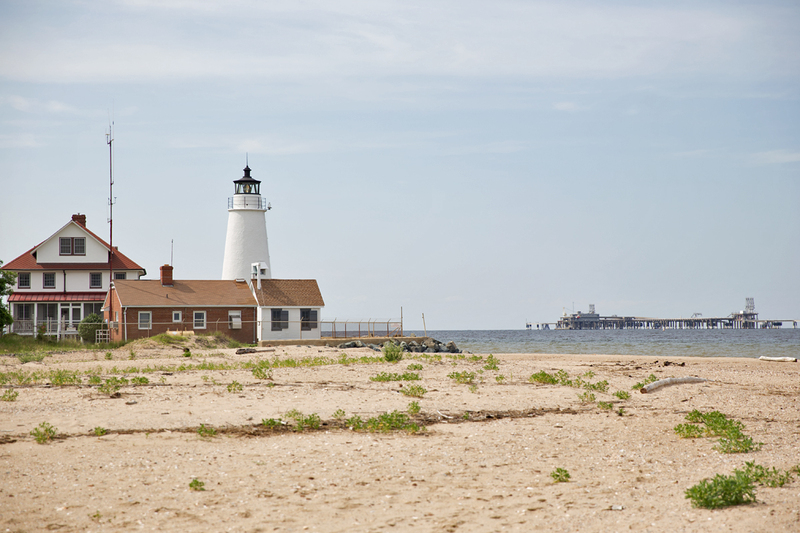 Cove Point Lighthouse sits within sight of the Cove Point LNG terminal. Segall wants the federal government to study the larger upstream impacts. Natural gas exports may be a good deal for drillers, their investors, and landowners who leased their mineral rights. But Segall thinks more thought should be given to Pennsylvanians who get few of the benefits of drilling but most of the burdens. So what would Segall say to someone living in Tokyo, facing rising energy costs? “I think that’s absolutely the hardest question,” he told StateImpact. Segall says renewables should be pursued. But in the meantime, he has no easy answer. Segall also says the increased tanker traffic in the Chesapeake Bay could upset its already threatened ecosystem. Dominion Resources says converting the Cove Point plant will create thousands of new jobs in Maryland and upstream in Pennsylvania. The company expects the Department of Energy to make a decision on its application by the end of the year.